When Fox first announced that Dark Phoenix would skew closer to the original X-Men story of how Jean Grey ultimately becomes one of the most powerful mutants to exist, the implication was always that this take on the story would involve space travel and an encounter with beings from another planet. In a recent interview with IGN, director Simon Kinberg and actress Sophie Turner spoke about how the people in Jean’s life play a huge role in her sudden evolution into Phoenix. Everyone around Jean has somewhat mixed motives, Kinberg said, and it all contributes to a manifestation of the Phoenix force that heralds the arrival of, well, aliens. She is from, let’s say, not our planet, her character. I’ll keep it relatively mysterious but it is a cosmic story in a way that is extraterrestrial, which is something we’ve never done in the X-Men movies before but is obviously something that is integral to the Dark Phoenix story so I felt we couldn’t’ do what we did on X3 and ignore that. We had to actually embrace it. So there’s a fair amount that takes place in space, and the inciting incident that starts to turn Jean, let’s say, dark and fill her with this power that she can’t control happens in space. And then there are forces from space that come to Earth because of that. A number of fans have theorised that Chastain’s character might have been a take on Mastermind, a character in Marvel Comics who uses his abilities to manipulate Jean in order to gain access to the Hellfire Club. It’s an interesting one and I don’t want to spill too much about it but basically Jessica’s character is very interested in this power that I’ve kind of acquired and this cosmic force that I have and she kind of wants that force to use it for her own — she has her own intentions with it and she kind of wants to use that. And she nurtures me in a way to make me kind of trust her. Both Turner and Kinberg added that Charles Xavier’s complicated relationship with Jean will also play a large role in the film — particularly the idea that at some point in Jean’s life, Xavier did something to Jean that leads to the rest of the X-Men and Magneto to hate him. And people in the movie start to blame him for that not realising what’s actually happening to her. So, yes, he did some things in the past that one could see as dubious but he did them for a good purpose, from his point of view, and so as Jean is losing control and doing these sometimes horrific certainly destructive things, for lack of an explanation for many of the characters because they don’t understand this larger cosmic entity, they are looking at Charles as the one responsible for it when in fact the movie sort of operates on two planes. It operates as a very personal, intimate story about Jean and her past and her struggle with her powers, and it also operates as this much larger intergalactic story with aliens involved that Charles is not responsible for. Perhaps even more surprising is that the mutants Red Lotus (Andrew Stehlin) and Selene (Kota Eberhardt) are set to make their first appearances in the X-Men franchise. 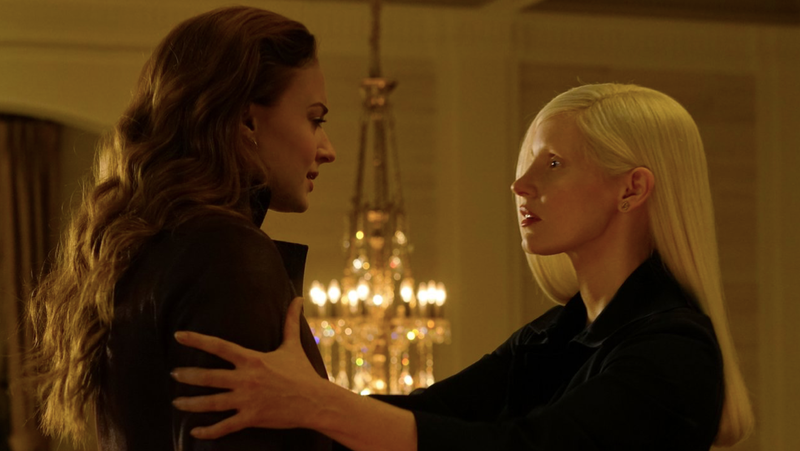 Just how the newcomers are going to be able to hold their own against Jean and her might is anyone’s guess until Dark Phoenix hits cinemas next year.